This trader hopes to sell 60 animals this year from his sidewalk paddock. Once a year New York City sidewalks fill up with pine trees for sale. Once a year Jakarta sidewalks fill up with livestock for sale. As Muslims plan to sacrifice them in Allah’s name – as I wrote in our previous post. 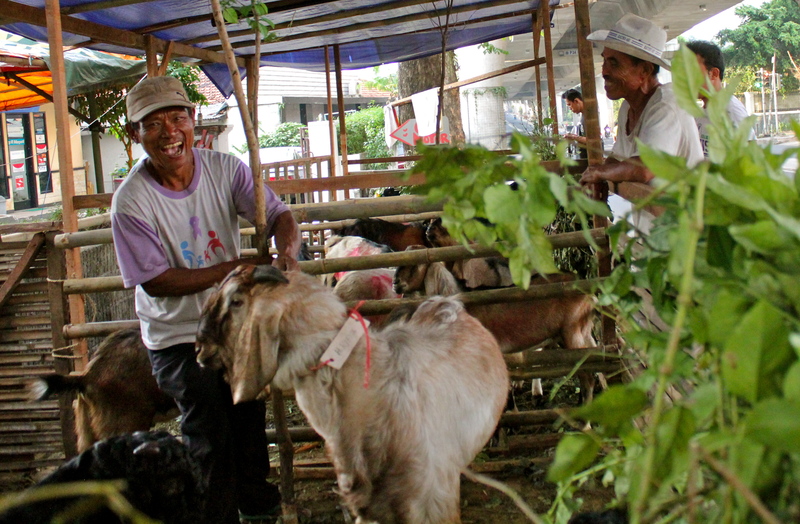 Buying a goat for Eid-ul-Adha in Jakarta is as common as buying a Christmas tree in Manhatten — so ubiquitous that it merits little mention in local media. Just a few days befor Eid-ul-Adha, this man was asking for over $400 for this one goat. But in Indonesia, the tradition comes with risks. Jakarta is congested, hot and lacking in regulations; add an untold number of livestock packed into small streetside pens and it’s a recipe for disease. The city’s Public Order Agency has allowed sellers to violate local law by occupying public spaces, setting up makeshift stockyards on sidewalks and along roadsides around Jakarta. 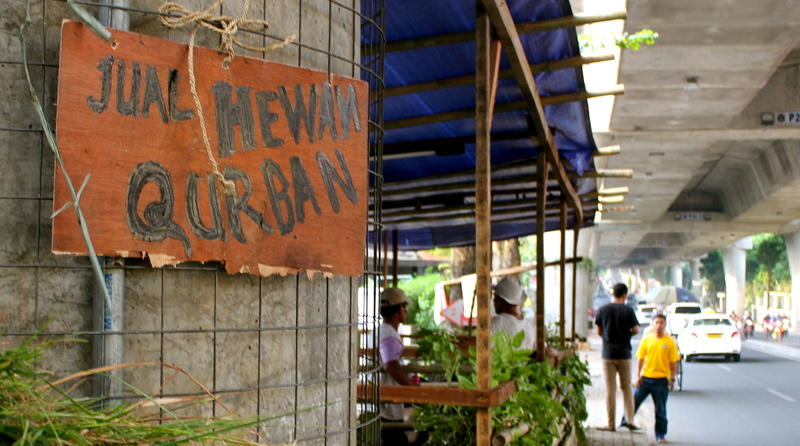 But beginning next year, traders will be prohibited from using sidewalks in central Jakarta, thanks to an agreement signed by the mayor and the sellers’ representative. Next year will mark the first time that such a restriction will be implemented. Disease from the hewan qurban — literally, “sacrifice animals” — is a risk. Though Islam dictates strict standards for the health of animals before they are slaughtered and eaten, many animals around Indonesia carry diseases that are difficult to detect. The South Jakarta Husbandry and Fishery Sub-Department has already inspected more than 22,000 animals for anthrax, which can be passed to humans through contact with infected animals or feces. As I have discovered on Jakarta streets, contact with animals — or their feces — is very difficult to avoid. Volunteer veterinary students and professors will inspect animals for disease around Java. In some cases last year, volunteers identified parasitic worms and stopped the infected meat from being distributed to the poor. These inspections will reach only a fraction of those animals to be sacrificed on Tuesday. 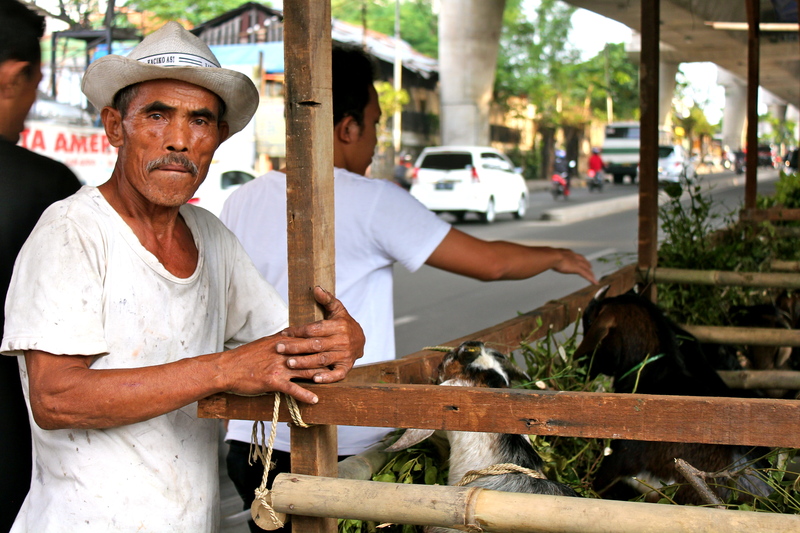 With the religious pressure to participate in the ritual, Jakartans choose animals off street corners, often with no veterinary advice; mosques distribute meat from sacrificed animals to the poor. Outbreaks of foodborne illness can be dangerous for a population that already has limited access to health care. I will continue to update the blog this week as we watch Eid-ul-Adha’s impact on Jakarta. Signs like this one advertized “sacrifice animals for sale” around Jakarta. This entry was posted in Culture, Indonesia, Our Daily Life, Religion and tagged anthrax, cows, eid ul adha, foodborne illess, goats, Jakarta, livestock for sale, public health, Sacrifice, sacrifice animals. Bookmark the permalink.